STEI won second prize in the ITB Web Unit Award. 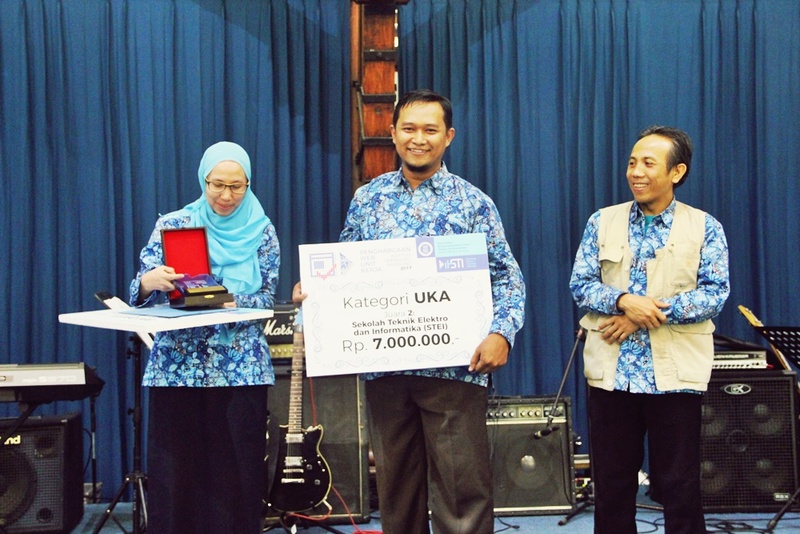 The award was awarded on February, 2018, at the ITB rectorate building, Tamansari. The socialization of the competition began in August 2017, and the assessment was conducted in October 2017. The philosophy of the implementation of this work unit web contest is not only to increase the ranking of ITB, but also to build awareness of all parties in the work unit to always pay attention and manage the information on the website so they would be able to convey information through the website properly and correctly. ITB hope this activity becomes an activity driven by top ITB leadership (in this case is Rector of ITB) to encourage all heads of work units to pay attention and support the implementation of this activity. This activity will of course continue to continue to form a culture in the environment unti work to organize and manage information through the media website. The method used in this assessment is the self assessment in which the work unit can fill the present condition in the work unit through survey documents to be prepared by the competition committee. In this phase, the questionnaire document can be used is the KIP survey document, while for the assessment of the data management and information management aspects, the web competition committee team will prepare the filling questionnaire first. Especially in the assessment of webometric academic work units, the jury team using tools such as google scholar, majestic and nibbler so hopefully on the process of appraising this web unit contest can be implemented transparently and auditable. The official website of Bandung Institute of Technology www.itb.ac.id was first released to public in 1997, or one year since Internet used in Bandung Institute of Technology. Since then, the official website of the Bandung Institute of Technology has been eleven times renewed, in terms of appearance, content, as well as back-end technology. Along with technological developments and resources owned by Bandung Institute of Technology, work units began to create official website pages respectively. In line with the vision and mission of Bandung Institute of Technology to become World Class University, the official website of ITB website is also a major component in Webometrics college ranking. The workstations website page also becomes a support component in Webometrics ranking. Therefore, active participation from all civitas is required to provide data and information related to the implementation of Tri Dharma Perguruan Tinggi activities to the official website of Bandung Institute Web Technology’s official web site and web faculty / school.